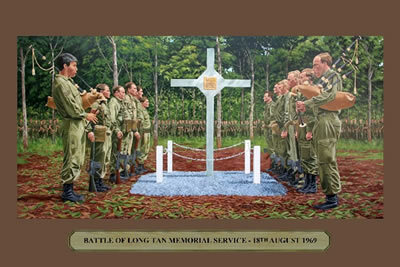 This mural, by Fraser Coast artist Blake Greer, depicts the Long Tan Cross Service held on 18th August, 1969. "In memory of those members of D Coy and 3 TP 1APC SQN who gave their lives near this spot during the Battle of Long Tan on 18th August, 1966. Erected by 6RAR/NZ (ANZAC) BN 18 Aug 69." Soldiers are from left to right: Piper Newland, Brown, Campbell, Reilly, Beere, O'Rourke, Rankin, Richardson, Akell, Halls, Roche, Piper Black. The Museum is also home to a full size replica of the cross. Read about Blake Greer and his other murals housed at the museum. 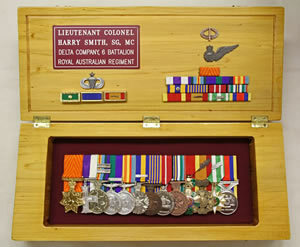 The Museum has been fortunate to acquire, on permanent loan, the medal group awarded to Lieutenant Colonel Harry Smith. Harry was awarded the Military Cross, (downgraded from a Distinguished Service Order), for his leadership and command of Delta Company 6 RAR during the battle of LONG TAN on the 18th August, 1966. This award was upgraded in the 2008 Long Tan Recognition review by the Australian Government to a SG (Star of Gallantry) which is one of only five ever awarded for acts of great heroism or leadership and command in action. Under the new awards, the SG is the next highest award after the Australian Victoria Cross. Museum Director John Meyers said that the Harry Smith medals are equal in historical significance to Keith Payne's Victoria Cross for the Vietnam War (1964 to 1973). This flag is from the Long Tan battlefield and was presented to the Museum by Eric Andrews of Stanthorpe (2nd Lieutenant, 8 Platoon, C Company, 6RAR). Eric Andrews said, "At first light on the 19th August 1966, I was commanding 8 Platoon of Charlie Company 6 RAR, when we arrived at the Long Tan battlefield. Our task for the day was to provide protection for Battalion Headquarters and to assist in clearing the battlefield. I souvenired this Vietcong flag on this day whilst my platoon buried fifty-two enemy dead. This was a very emotional day". Eric explained that the blood stained flag had been kept in cupboards for the last 40 years, as firstly his wife would not allow it to be displayed, and then when he gave it to a mate, his wife also felt the same way. Even today you could hear the emotion in his voice. 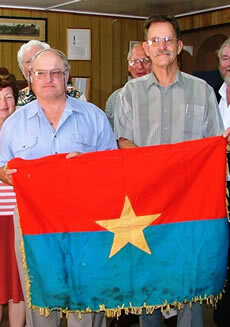 Eric had been introduced to the Military Museum by Adrian Pitman, when Eric came to Maryborough in preparation for orienteering competitions to be held here. Eric is the map maker for Orienteering Australia. He was impressed by the standard of the Museum and was glad to see items being displayed other than in Canberra – it was the perfect place for his flag.